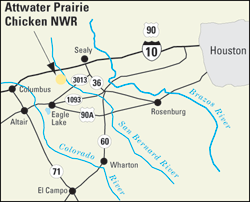 Attwater Prairie Chicken National Wildlife Refuge (APCNWR), located approximately 60 miles west of Houston, Texas, is one of the largest remnants of coastal prairie habitat remaining in southeast Texas and home to one of the last populations of the critically endangered Attwater’s Prairie-Chicken, a ground-dwelling grouse of the coastal prairie ecosystem. The refuge is one of a handful of national wildlife refuges managed specifically for an endangered species. From Houston: Take I-10 west to Sealy. Drive south 1 mile on Highway 36, then right on Texas Farm to Market Road (FM)3013 for 10 miles. From San Antonio: Take I-10 east to Sealy. Drive south 1 mile on Highway 36, then right on Texas Farm to Market Road (FM)3013 for 10 miles. From Eagle Lake: Take FM 3013 northeast for 6.5 miles. The refuge attracts the highest number of visitors during the spring, peaking in March and April when wildflowers are abundant. The refuge hosts the annual Attwater’s Prairie-Chicken Festival, Booming and Blooming Festival, the second weekend in April except when it falls on Easter weekend, then it will be the weekend prior. Attwater’s Prairie-Chickens are also most active in spring, but their low numbers limit your chances of actually seeing them. If possible, visit the refuge in every season to witness wildlife migration, courtship, nesting, and the changing colors of the prairie itself. The Visitor’s Center is open from 7:30am to 4pm Monday through Friday. The Visitor’s Center is a great place to find maps and brochures and to view the wildflower identification guide. Stay awhile, relax and view a video about the endangered Attwater’s prairie chicken and sharpen your birdwatching skills by taking a look at more than 100 taxidermy bird mounts. Be sure to enjoy the native plant display of grasses and wildflowers surrounding the flagpole. The visitor center is also where the business of the refuge is conducted. The 10,339 acre refuge is made up of native prairies, croplands, marshes, ponds, woodlots and riparian areas. A variety of birds use the area for nesting and winter habitat. Along with the Attwater’s Prairie-Chicken, other species include White-tailed and Ferruginous Hawks, Crested Caracaras, LeConte’s Sparrows, Sprague’s Pipits, Loggerhead Shrikes and most waterfowl species common to the central flyway. Many additional species can be seen during spring and fall migrations. Two hundred sixty six species plus seventeen occasional or accidental” species have been sited. Due to low population numbers, you may not see the Prairie-Chickens when you visit the refuge, but they are here, valiantly struggling to keep their species alive. When in the Visitor’s Center, make sure you obtain the Birds of the Attwater Prairie Chicken National Wildlife Refuge Field Checklist or download one by clicking here. Dawn and dusk are the best times to see wildlife. In warmer seasons, little is moving on hot summer afternoons or on windy days. Observe from the sidelines. Leave “abandoned” young animals alone. A parent is probably close by waiting for you to leave. For a closer look, bring binoculars. Try sitting quietly in one good location. Let wildlife get used to your presence. Many animals that have hidden will reappear once they think you are gone. Walk quietly in designated areas, being aware of sounds and smells. Often you will hear more than you will see. For photos of what you may see at the refuge, please see the photos and videos page. A five-mile auto tour and two hiking trails offer pathways into the prairie and along Coushatta Creek. Be sure to bring your binoculars and a camera. Refuge trails are open every day of the year from sunrise to sunset. All motor vehicles must stay on the designated auto tour route. The road is unimproved and adverse weather may force the refuge staff to close the road at certain times. The auto tour loop can also serve as a hiking trail. The Horseshoe Lake Trail and bird blind are located just beyond the Visitor Center. The Sycamore Trail provides excellent opportunities to enjoy the native coastal prairie as well as riparian areas. Both trails are approximately 1 mile in length, with a 0.5 mile connecting trail between them. Enjoy the magnificent wildflowers, butterflies and tall grasses as you walk along this beautiful trail . Please note, you may encounter venomous snakes, mosquitoes, alligators and fire ants as you explore, so please be mindful and do not disturb them. Groups interested in special programs are encouraged to call ahead to make sure staff is available. Individuals with disabilities are encouraged to contact the refuge for information on special accommodations. Friends of Attwater Prairie Chicken Wildlife Refuge is currently developing environmental education programs and materials to deliver to area schools. To help with this initiative, or to set up an educational visit for your students, contact the refuge staff. The public is invited is to join us annually for the Attwater’s Prairie-Chicken Festival, Booming and Blooming, the second weekend in April, except when it falls on Easter weekend, then it will be the weekend prior. This is one of the best opportunities to observe the outstanding “booming” exhibit of the Attwater’s prairie chicken on the traditional mating grounds, or “leks.” Guided birding tours, wildflower walks and refuge tours are also offered during this weekend event. Visitors may reserve a spot on a guided van tour of the refuge, conducted on the first Saturday of each month (need to confirm if they are doing this all year or selected months) by contacting the refuge headquarters. Christmas Bird Count: From mid-December into January thousands of volunteers across the country take part in this popular citizen-science program! The Attwater Prairie Chicken NWR count circle regularly ranks in the top 20 nationally for total species observed. Join the effort on Wednesday, December 18, 2019. Contact compiler Sumita Prasad to find out details and volunteer opportunities. International Migratory Bird Day, (IMBD), held annually on the second Saturday in May is an invitation to celebrate and support migratory bird conservation.